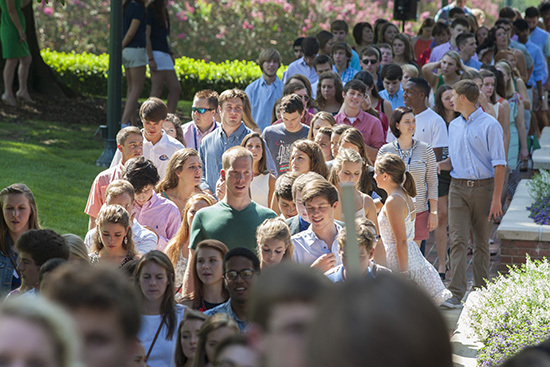 Samford University will welcome its largest freshman class in history for the start of the fall semester this weekend. A total of 810 entering freshmen are scheduled to move onto campus Friday, Aug. 14, as Samford begins its 174th year. The previous high for freshmen was the entering class of 2013 with 755 freshmen. With transfers, the university will have more than 1,000 new students this fall. Total enrollment is expected to exceed 5,000 students for the first time in history. The previous high for total enrollment was last year’s 4,933. A total of 2,323 students will live in university housing, another record. Kimrey credited the efforts of the Samford admission staff led by Dean Jason Black for continuing to produce record enrollments of students of high academic quality and leadership. Kimrey said several factors have provided momentum recently for Samford, including the formation of the College of Health Sciences, the opening of the new Brock School of Business building and the acquisition of the Southern Progress property.